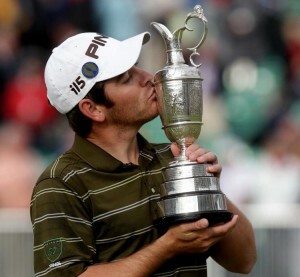 Louis Oosthuizen kisses the claret jug. Copyright Getty Images. On Sunday 18 July 2010 Nelson Mandela celebrated his 92nd birthday. On the same day another South African, 27-year-old Louis Oosthuizen achieved a remarkable victory at St Andrews, the home of golf. It was the 139th time the world’s best golfers had competed for the British Open Championship and Oosthuizen was a 200-to-1 outsider. He carded rounds of 65, 67, 69 and 71 for a 272 total and a stunning seven-shot winning margin over Lee Westwood, with Rory McIlroy a shot further back. Less than a year later it was the turn of Oosthuizen’s compatriot, Charl Schwartzel, to demonstrate his competitive spirit. 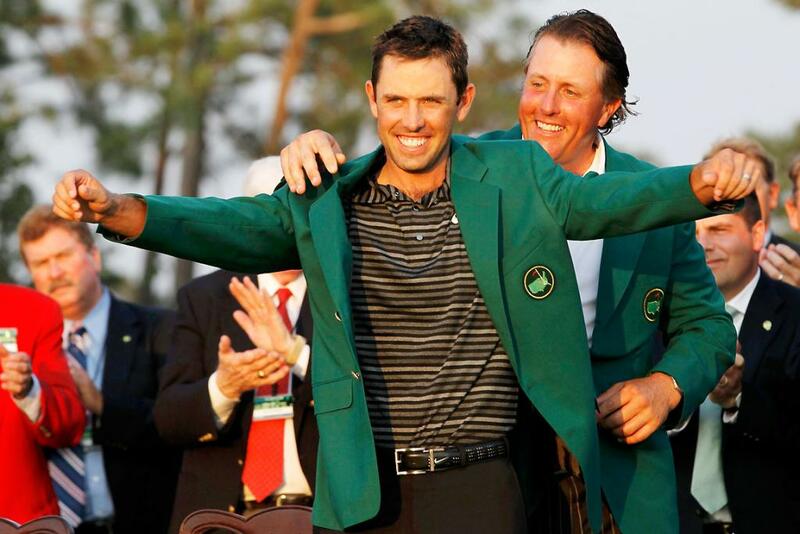 On Sunday 10 April 2011, fifty years to the day after Gary Player became the first foreign player to win the Masters, Schwartzel won the 75th playing of this iconic event at Augusta National Golf Club. He charged through the field, scoring a birdie on each of the last four holes for a closing 66, good enough for a two-stroke victory over his nearest challengers, including defending champion Phil Mickelson and Tiger Woods. Phil Mickelson helps Charl Schwartzel don the green jacket. Copyright Reuters. This year, on 8 April 2012, it was Louis Oosthuizen’s turn at the Masters. Playing in the final round with Bubba Watson, Louis played a remarkable shot at the second hole, a par 5. A solidly struck four-iron pitched on the green and rolled into the cup for an albatross 2, rocketing him into the lead. Watson fought back and after 72 holes they were tied at ten under par which led to a sudden death play-off. The left-handed Watson then produced some magic of his own — blocked by pine trees he engineered a fabulous escape to within a few metres of the flag to clinch the green jacket. Without a victory since the 2011 Masters, Schwartzel has been struggling with his game and battling injuries but he’s just completed a superb comeback. Earlier this month he spread-eagled an international field, winning the Thailand Championship with a 25-under-par total that was a massive 11-shot margin. Then last week he went one better with a 12-stroke victory at the Alfred Dunhill Championship, a European Tour event. Oosthuizen is now ranked 6th in the World Golf Rankings while Schwartzel has climbed to 14th position. The business of medical imaging is no less competitive than professional golf. South African companies like Lodox and CapeRay are determined to deliver high quality, innovative products that can compete with the world’s best. Hmmm. No guesses about what you do when you are not inventing groundbreaking imaging stuff. With best wishes for the Festive Season, and a perfectly imaged New Year. I cannot tell a lie, David, I am indeed a golf nut! I do feel strongly, though, that we South Africans sometimes sell ourselves short when it comes time to compete on an international stage. Hence the theme for this particular blog.